News Archive. Louise Body. Wallpaper and Fabric Designer. 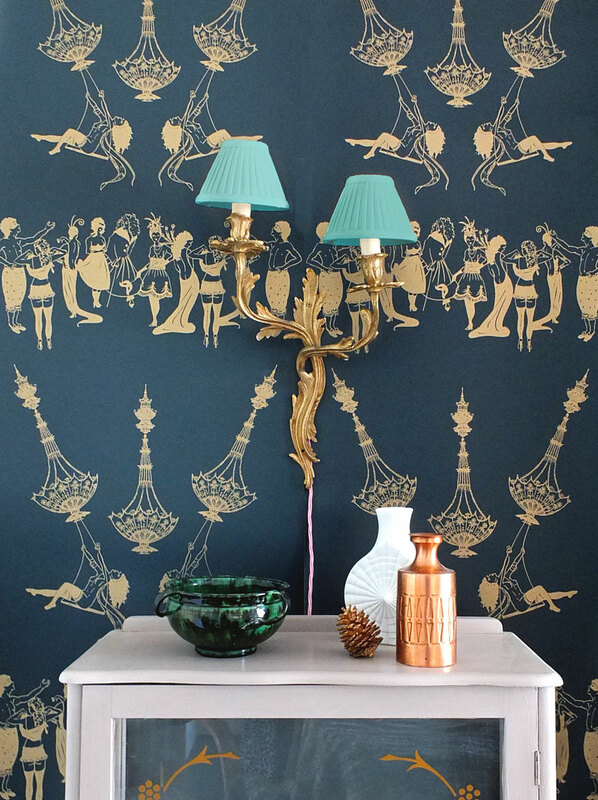 To celebrate 15 years of this iconic design (which was one of Louise's first wallpaper designs) we have produced it in a luxurious Antique Gold on a rich dark grey background. We think this would look amazing in a cosy dining room, bedroom or even the downstairs loo! I have added some new wallpaper printing workshop dates. Click here to find out more. 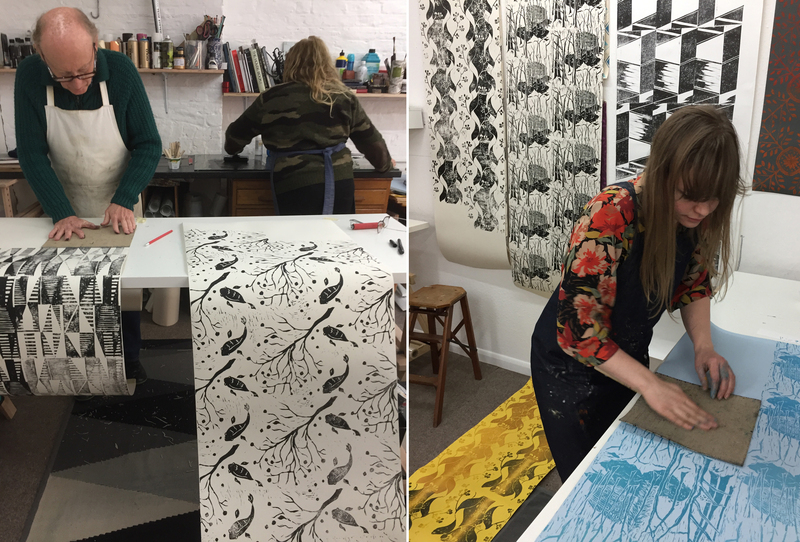 I will teach you how to design and print your own repeating wallpaper design from my studio by the sea in Hastings/St Leonards. Due the success of my wallpaper workshop in February, I have added another weekend date in March. 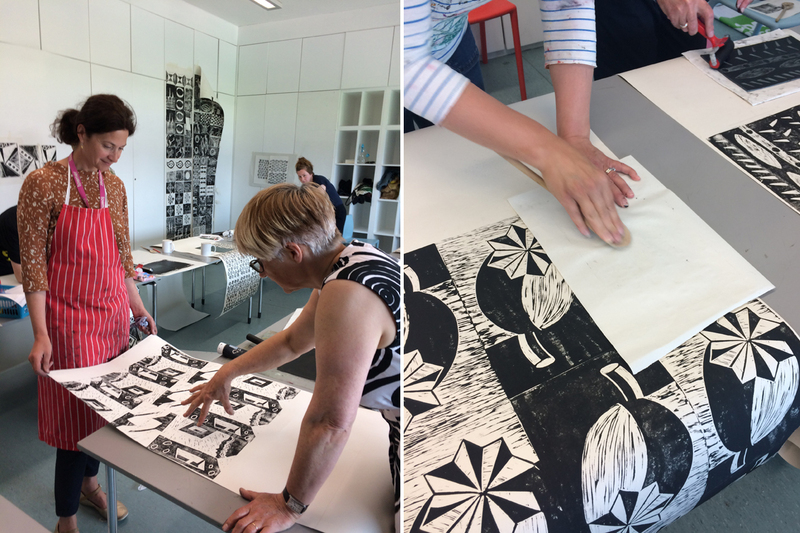 Learn how to turn a design into a half drop pettern repeat, carve a lino block and print some of your own amazing wallpaper! No experience needed. Come and join me in my studio and learn how to make your own block-printed wallpaper. I will teach you how to turn your design into a pattern repeat and how to create a simple Lino-cut design. January 24th 2018 One day workshop. Click here for more info. February 3rd & 4th 2018 Weekend workshop. Click here for more info. 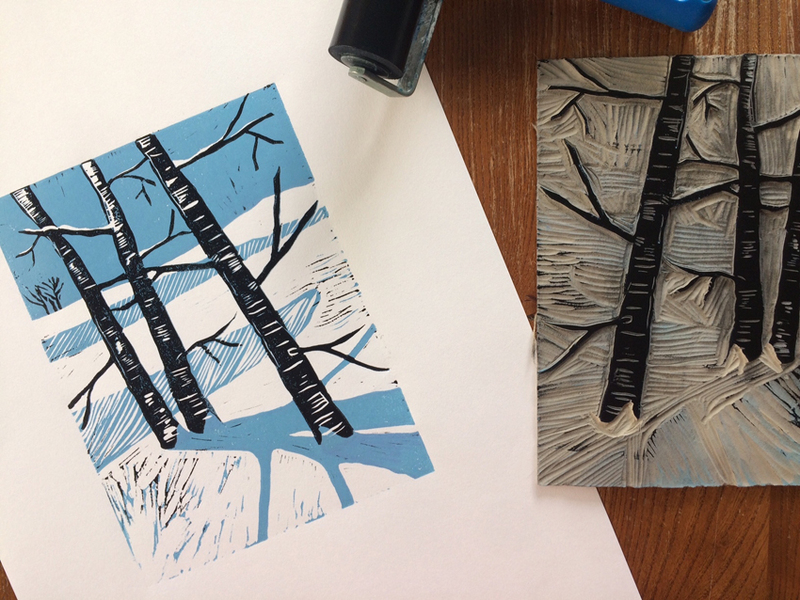 Join me in my studio and I will teach you how to draw, cut and print your own A5 Lino-printed design in 2 colours using the reduction-cut technique. Blank Cards will be provided if you would like to print christmas cards and also blank paper for special limited edition prints, ready to frame and hang on your wall or to give as a unique gift! Beginners and experienced are welcome. This fun and relaxed workshop is a great opportunity to learn new creative skills that you can carry on using at home from the kitchen table! 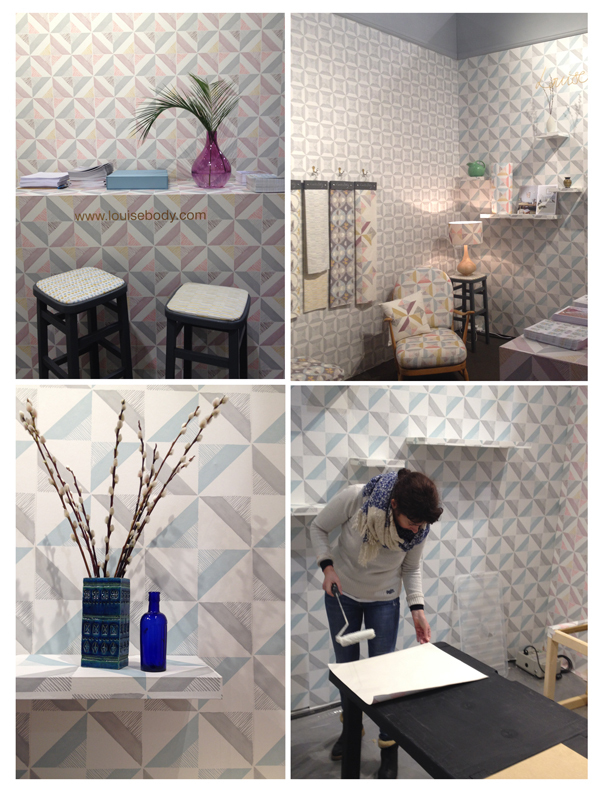 We had a great time exhibiting our new luxury hand-finished wallpapers at the London Design Fair. We had a really fantastic response and look forward to working with new clients and interior designers. Please contact us for more details and see more of these wallpapers here. I am delighted to be showing my new Bespoke and Hand-Finished wallpapers and murals at this years London Design Festival. I will be showing at the London Design Fair in The British Craft Pavilion, stand no.25 from 21-24 September. You can download a ticket here. I do have a limited amount of free passes, so if you are interested, please email me. 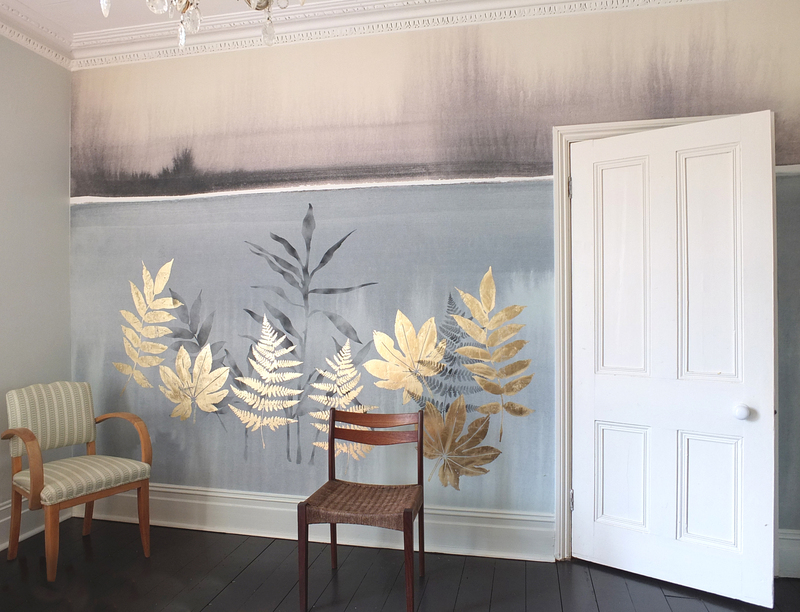 I have been creating new wallpapers and murals using a combination of digital printing, hand-painting and the application of gold leaf, I will be showcasing these for the first time at the British Craft Pavilion. 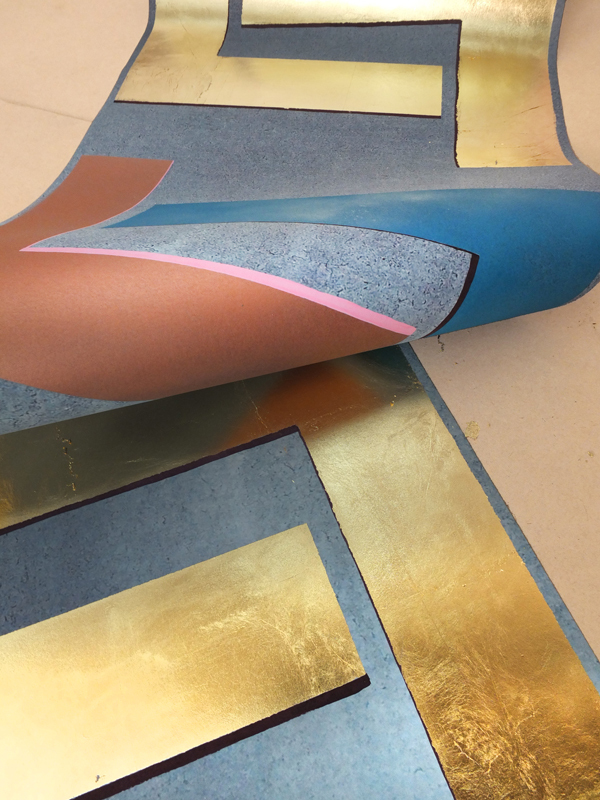 Getting ready to launch a new hand-finished wallpaper collection at this years London Design Festival. I have been experimenting with the application of gold leaf over my digital wallpaper murals and they look stunningly luxurious! I will be showing these at the London Design Fair, in the Craft Pavilion, Stand 25, Old Truman Brewery, London from 21-24 Sept. I am so thrilled to have my Garden Birds design turned into gift cards for the Victoria & Albert museum. It is a real privilege! Our Still Lake design is proving to be our most popular wallpaper mural. It instantly transformed a clients bedroom into an oasis of calm. Its a new year and that means we are getting ready to launch a new wallpaper. Photographing all my wallpapers at home can be problematic! 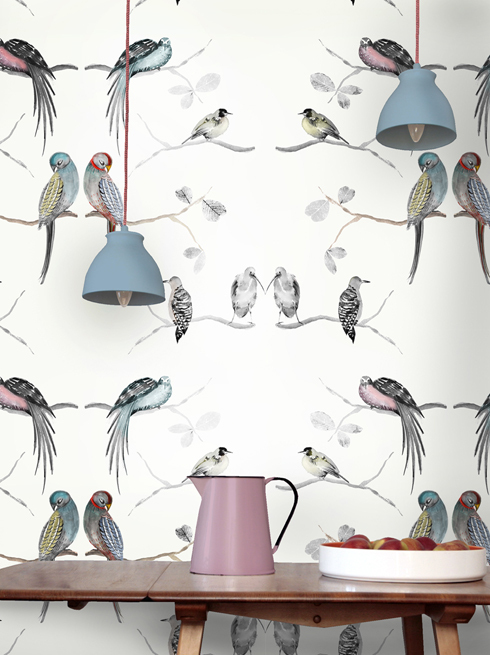 We are excited to announce the launch of 10 wallpaper murals designed by Louise. Available Summer 2016. 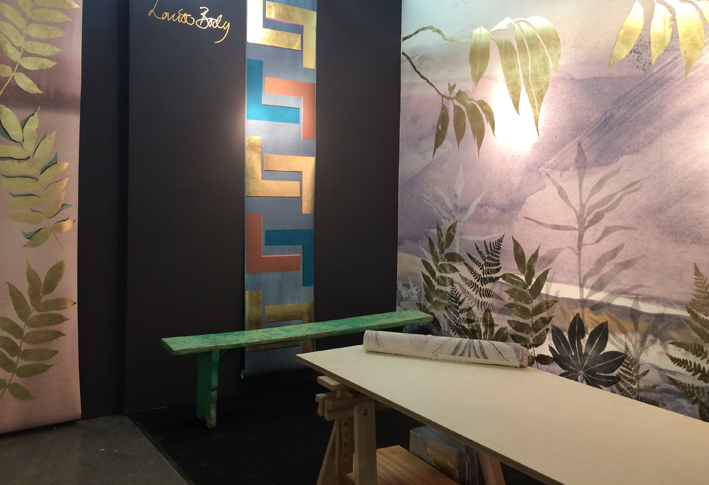 Louise Body has been designing and selling innovative wallpapers for 14 years and this year has broken away from the traditional repeated pattern wallpaper to work on an exciting range of wall murals. 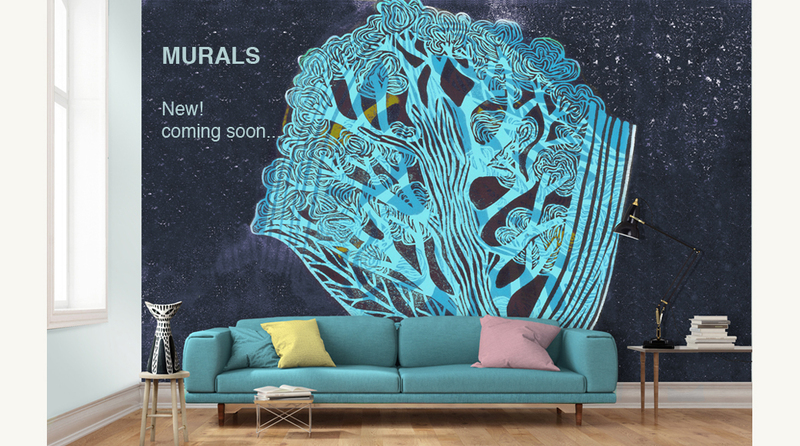 A fresh departure from traditional wallpaper, each wall mural has been designed to fill a wall with a piece of art. Louise has used a variety of techniques to create the original artwork from Lino printing to watercolour painting. All of the designs are influenced by natural forms, some abstract and some figurative. All of the designs would bring a colourful elegance to any room. 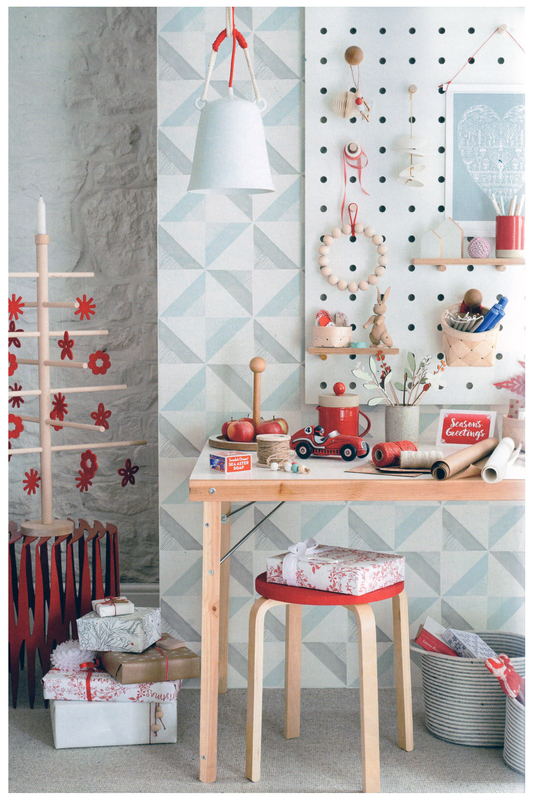 Here is our Chalk Tile wallpaper in the December issue of Coast Magazine. Please come and visit us on Sunday 6th December for a christmas Curiosity Bazaar. 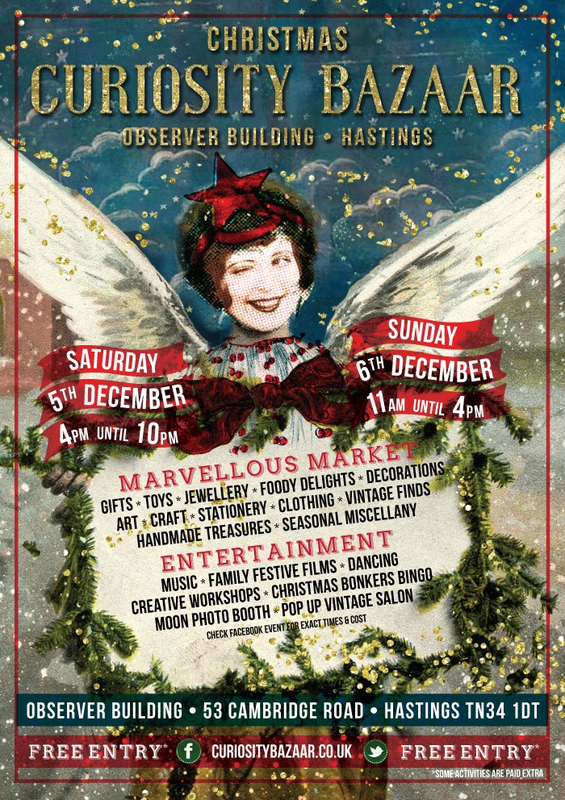 Located in the exciting Observer Building in Hastings, there will be lots of gifts to inspire and free entertainment! We will be selling a range of Louise Body cushions, craft packs, cards and more. Hope to see you there! 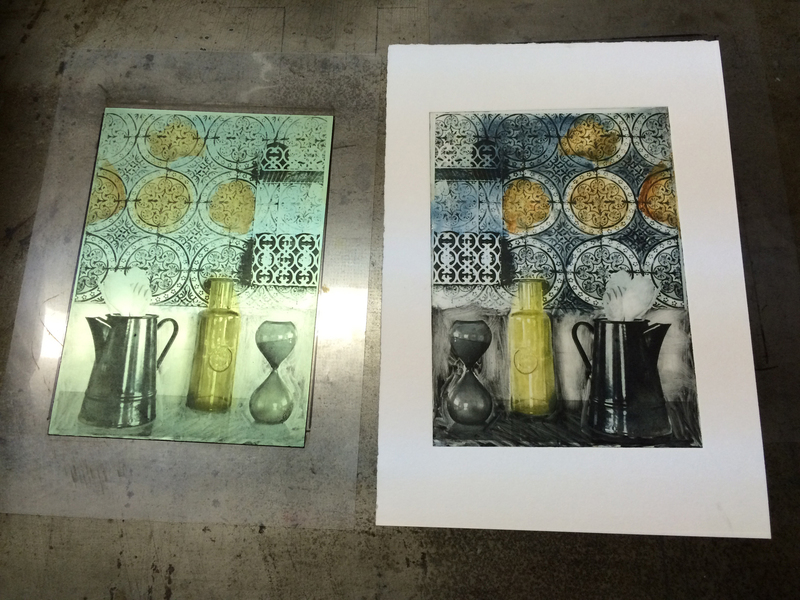 I had a great day last week learning a printing technique called Solar plate etching. These are the first results but I am keen to explore this more. A soft photographic look can be achieved with added painterly marks. 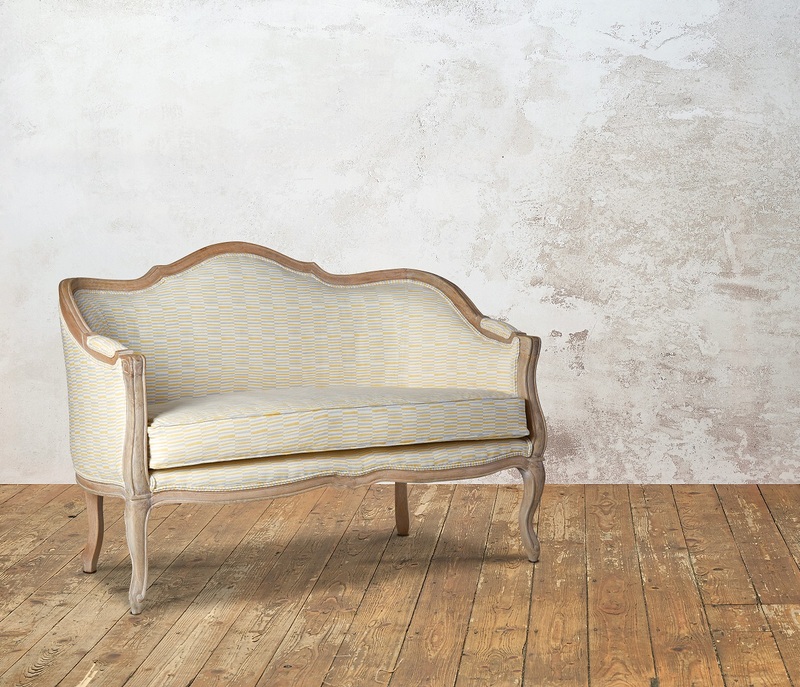 Swoon Editions have just launched the 'Louise' sofa using our Sussex Stripe fabric from the Peggy Collection. We are very pleased to announce our collaboration with furniture makers Swoon. 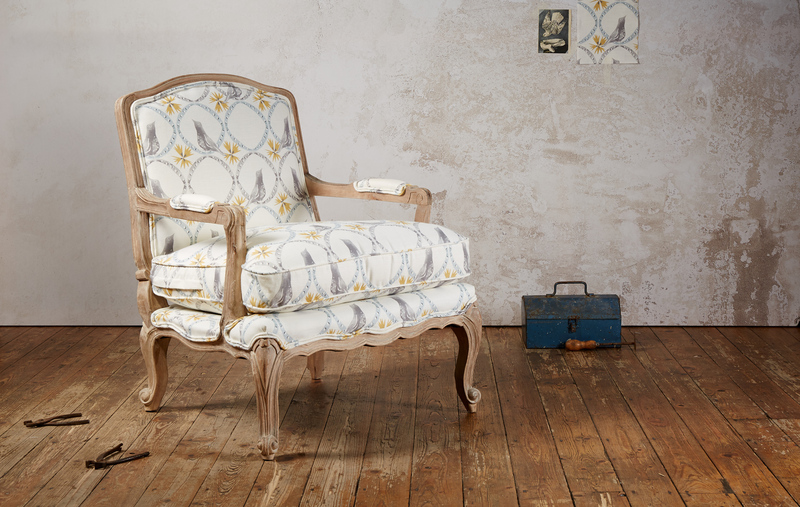 The first of our fabrics to be added to the collection is Calling Birds which has been paired with the Lille armchair. 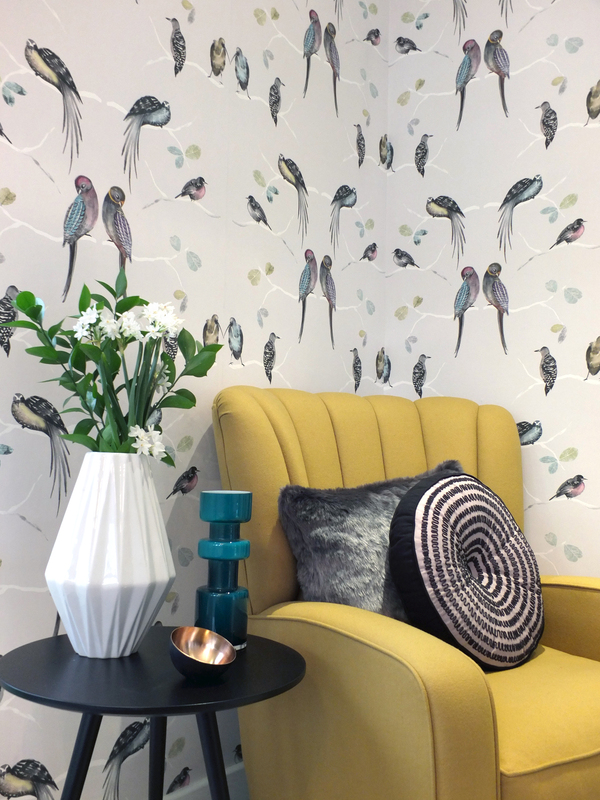 Our Perched Birds wallpaper was chosen for the master bedroom in the House Beautiful home at the Ideal Home Show in London. The collection was inspired by the life and work of Peggy Angus, prompted by Louise’s visit to an exhibition of her work at the Towner Gallery in Eastbourne. Below is a link to a very good Guardian article about her. Although the new ‘Peggy’ designs are not direct references to Angus’s work Louise was inspired by the personality of her designs and the techniques she employed. She has tried to maintain an artisanal, hand painted quality to the collection. All of the designs are hand painted but then repeated and printed using modern digital technology. Angus had a holiday house ‘Furlongs’ near Firle in the Sussex Downs so many of the design names reference Angus and Sussex places/landmarks. Calling Birds (fabric) – A hand painted design with a folk art feel featuring motifs of calling birds perched in rings. 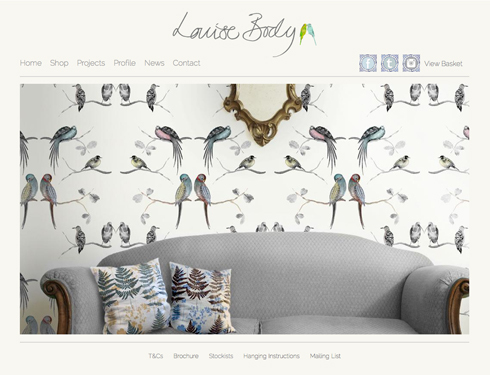 A nod to Louise’s heritage as a designer of ‘bird wallpapers’. Celestial Sky (fabric)– A hand painted design with a folk art feel featuring abstract moon and stars motifs. Dot to Dot (fabric – Gold & Rose colour ways) – A design consisting of repeating rows of hand painted bush marks which fulfills the roll of a traditional ‘spot’ fabric in the collection. The design name is a whimsical reference to children’s ‘dot to dot’ drawings. Firle Tile (wallpaper) – A hand painted, geometric tile design named after the Sussex village of Firle close to ‘Furlongs’ House. Sussex Stripe (fabric – Blue & Gold colour ways) - A design consisting of repeating rows of hand painted stripes which fulfills the roll of a traditional ‘stripe’ fabric in the collection. The design is named after the Louise’s home county where Peggy Angus had her holiday house. The collection has a timeless feel and will work equally well in traditional and contemporary homes. These fabrics and wallpapers have been carefully designed to work in harmony with each other using muted tones of gold, coral, teal, grey and highlights of hot pink. 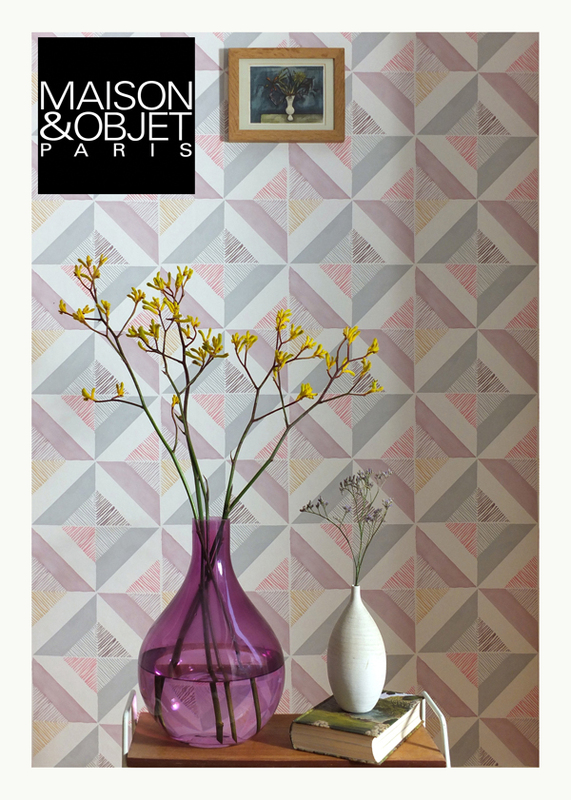 We will be launching our new collection of wallpapers and fabrics at Maison & Objet in Paris. 23-27 January 2015. 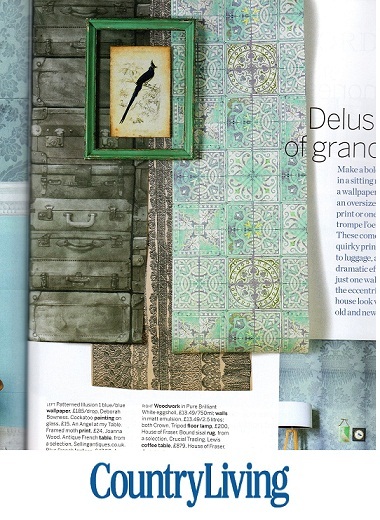 Our new Flora Tile wallpaper has been included in the October issue of Elle Decoration. 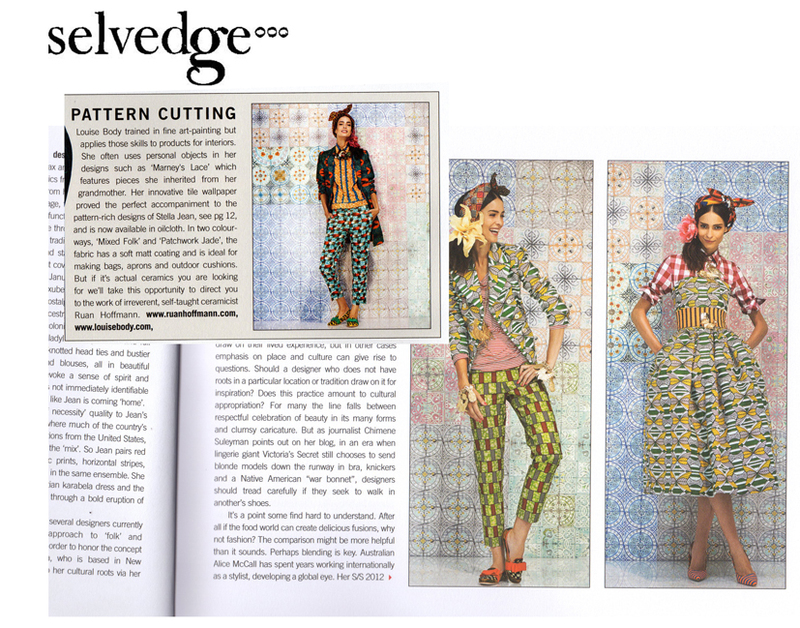 Being a big fan of Selvedge Magazine we are happy to be included in July's issue for our work with Fashion Designer Stella Jean. 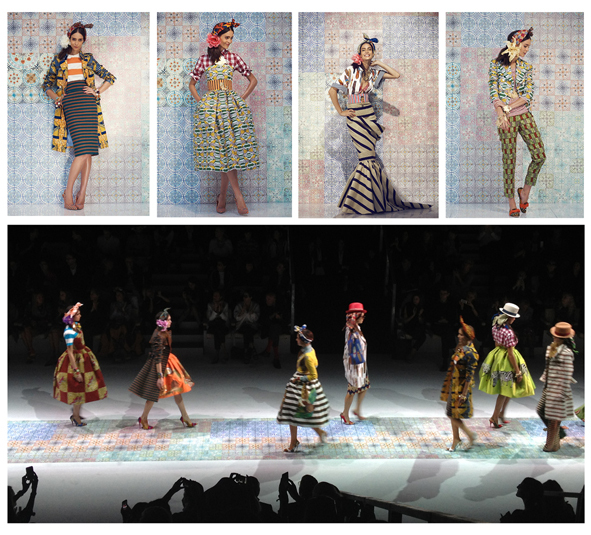 Our Tile Wallpaper was used on fashion shoots for Stella Jean and used on the catwalk for the Stella Jean fashion show at Armani Teatro in Milan. 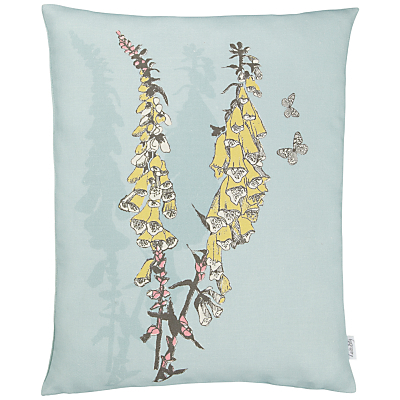 We have designed two new cushions to add to our exclusive collection at John Lewis. 'Tree Bird Perch' and 'Cow Parsley'. 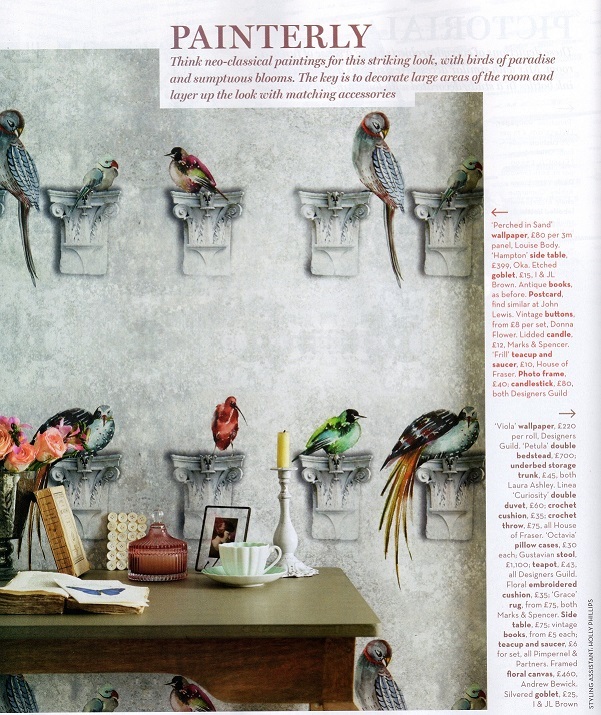 Our wallpapers were featured in this weekend's Telegraph magazine. Here you can see Perched wallpaper and Flight wallpaper on the walls of interior designer Louise Convert's house in St Leonards On Sea. 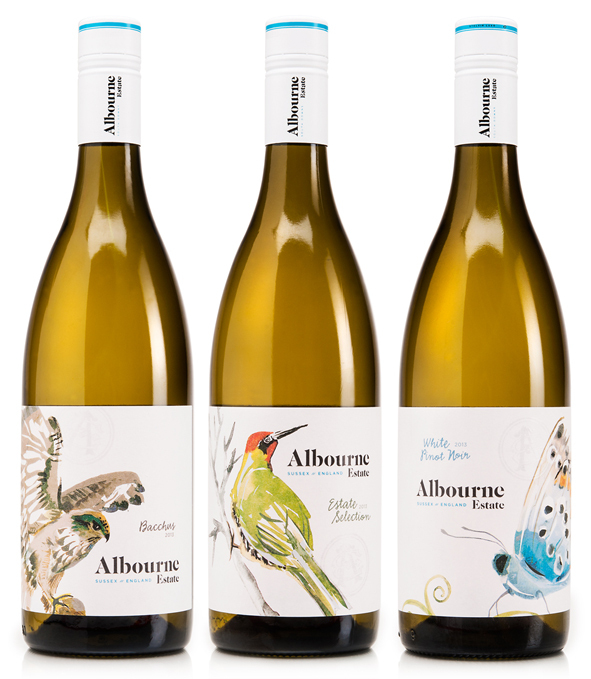 Louise was invited to illustrate some wine labels for Sussex vineyard Albourne Estate. Using her style of loose brush strokes and graphic print marks, Louise created some drawings of local wildlife often spotted on the vineyard. 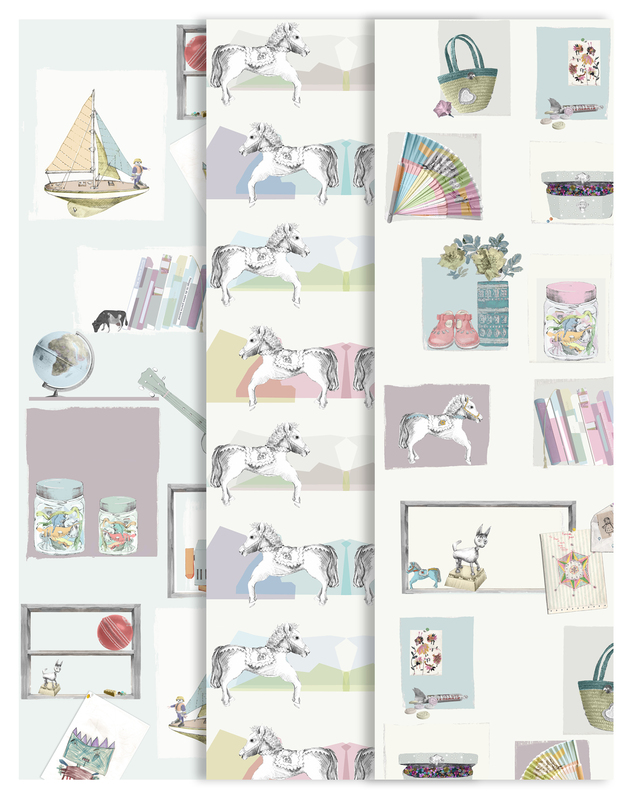 Previously sold as 70cm wide x per metre, we have now updated our printing production to the better value roll size of 52cm x 10m for our three beautiful kids designs: Horsey, Toyshelf For Boys and Toyshelf For Girls. A fun and inspiring addition to a child's bedroom or nursery, our children's wallpaper collection is now available at £84.00 per 10m roll. You can find us in the May edition of country Homes and Interiors. Our Plant Life fabric has been used along with our Cheese Plant prints to create this lovely spring feature. I don't usually find the time to get involved with local events but this one grabbed my attention. 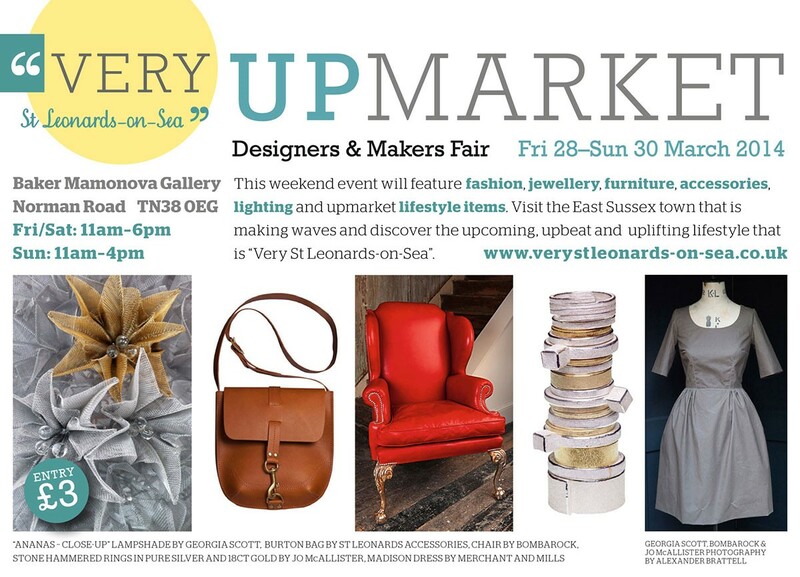 There are so many talented, professional designers and makers in St Leonards on-Sea and Hastings and this small event will be showcasing the best. 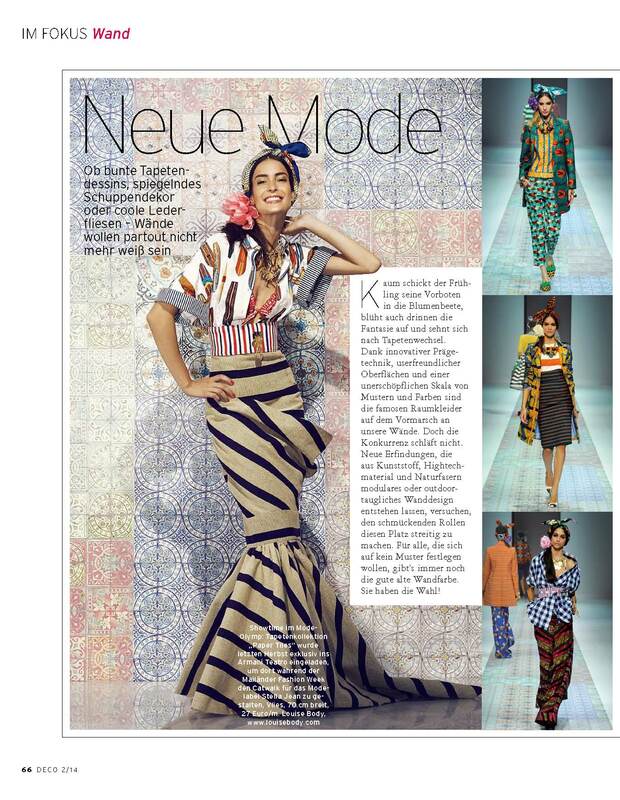 German magazine Deco Home have published an article on the use of our Tile Wallpaper during Milan Fashion Week for Italian label Stella Jean. 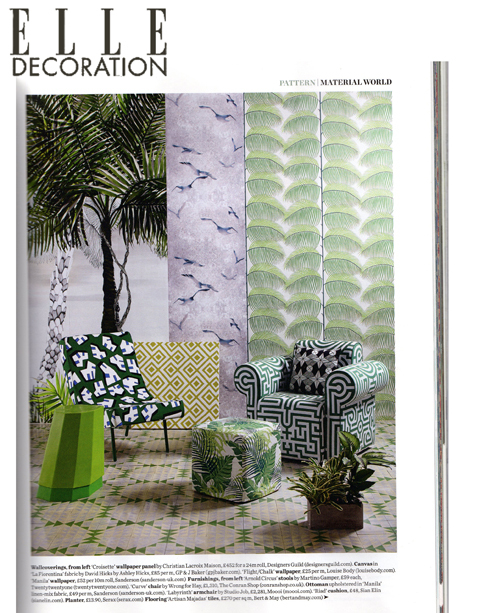 We are very pleased to be included in the April edition of Elle Decoration with our seagull wallpaper 'Flight'. We have been working hard on our brand new website which will be ready to go in spring 2014. 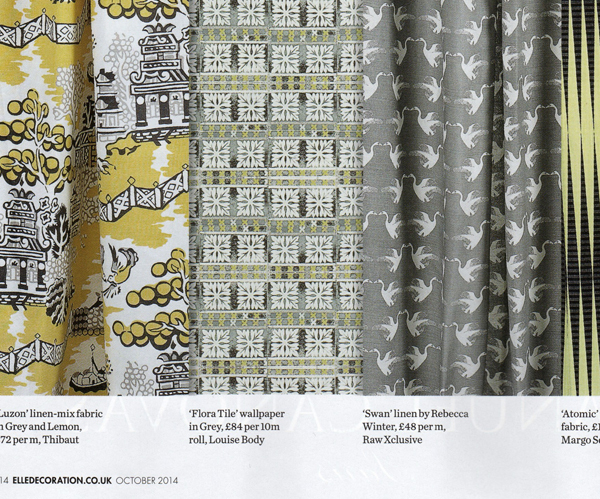 Thankyou to The English Home, Ideal Home and Living At Home for featuring our wallpaper and fabrics. Paper Tiles debut at Milan Fashion Week! We were very honoured to have been invited to the Armani Teatro in Milan to see our Paper Tiles wallpaper on the Runway for talented Italian fashion label Stella Jean. As well as providing a colourful runway at Armani Teatro they also form the backdrop for Stella Jean's fashion shoots for the new 2014 S/S collection. 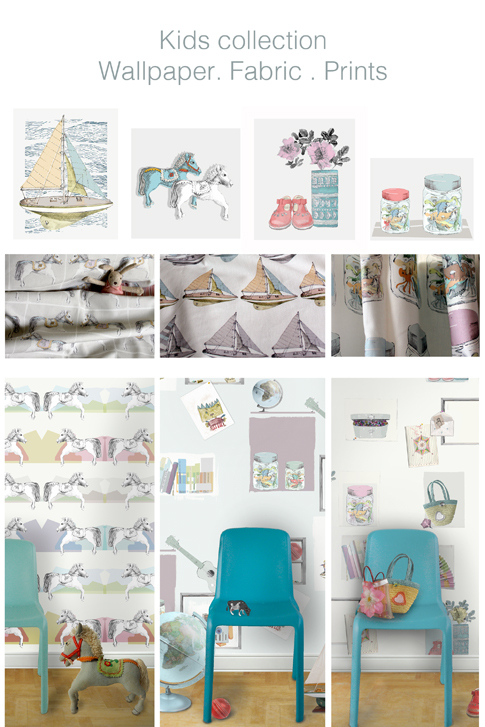 Having 2 children myself, I was very aware of the lack of interesting wallpapers and fabrics available for children which inspired me to produce my first kids range of wallpapers, fabrics and prints. The designs have an illustrative feel and I have used my children's loved possessions as well as my own childhood drawings to inspire the collection. They are intended to stimulate young imaginations by using a combination of paintings drawings and photographs and feature a range of different sized objects from books and shoes to tiny beads and marbles, all waiting to be discovered and explored. The collection consists of 3 wallpapers, 3 fabrics and 4 prints. We are very happy to celebrate 10years of business this year. Our small company has been steadily growing over the past 10 years and we hope that the next decade will be even more exciting! In celebration of our birthday we are offering you a limited edition print of one of Louise's drawings from an early wallpaper 'Holy Cow'. 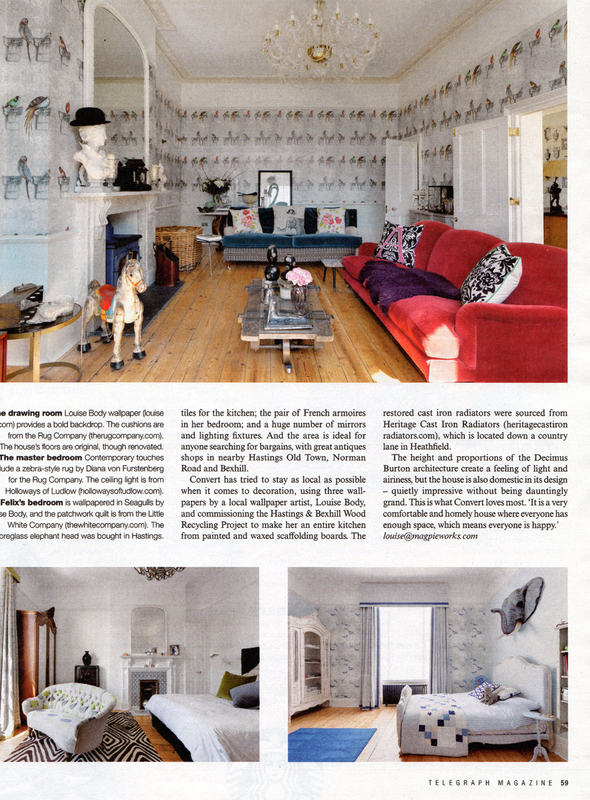 We have been featured in the March issue of Homes & Antiques magazine. We think this is a great photo and shows off the 'Perched' wallpaper really well. We are very excited to be adding a new bird design to our fabric collection. You can find it in our shop on the website. 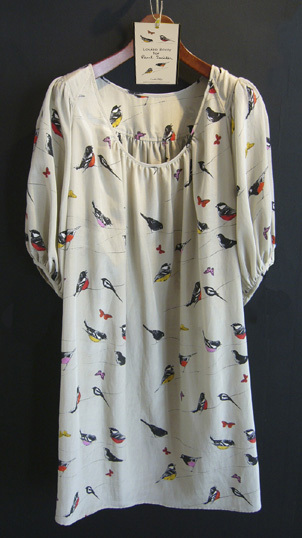 Printed onto Linen Union this design features Louise's watercolour paintings of birds. You can also buy Limited Edition Prints of the birds in our Prints section. 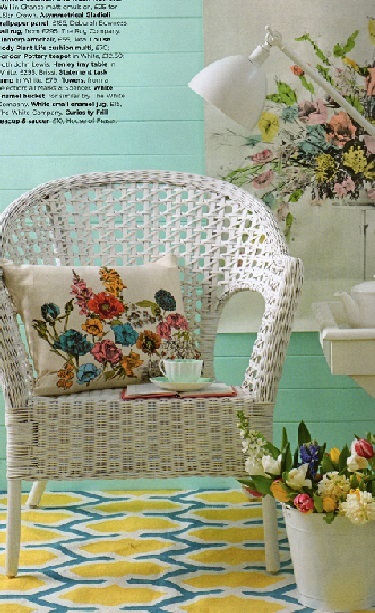 Our Plant Life cushion, designed exclusively for John Lewis is shown here in Good Homes magazine. Country Living Magazine April 13. Paper Tiles and Marneys Lace featured. 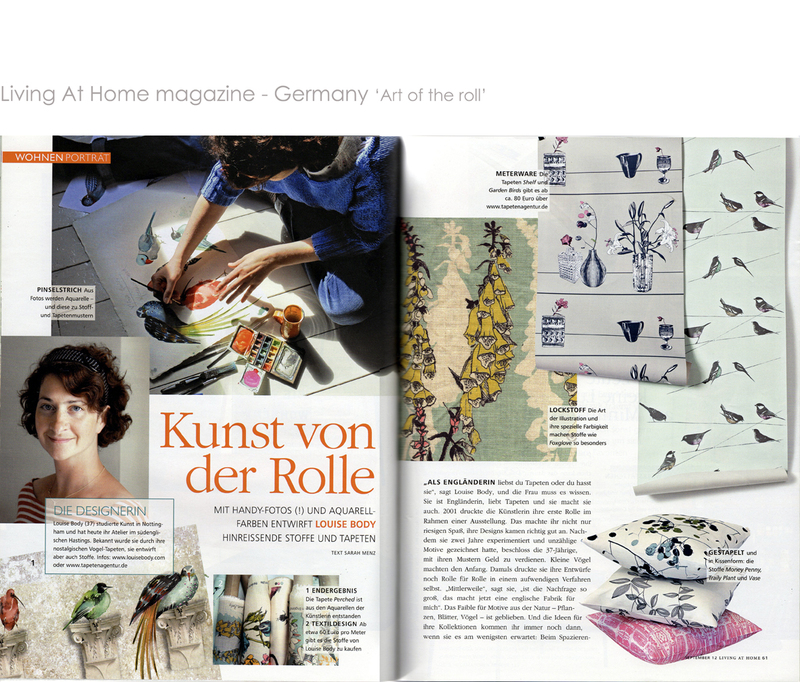 Louise and her work featured in Living at Home magazine - Germany. Due to the popularity of Louises Limited Edition, signed prints we are excited to be adding some more to the collection.These are high quality Gyclee prints taken from Louises original screen prints produced for her Plant Life wallpaper.These are numbered and signed by Louise and each one is an edition of 100. You can find these in the print section of the shop. You can now find a selection of our fabrics in the larger John Lewis stores and on-line. 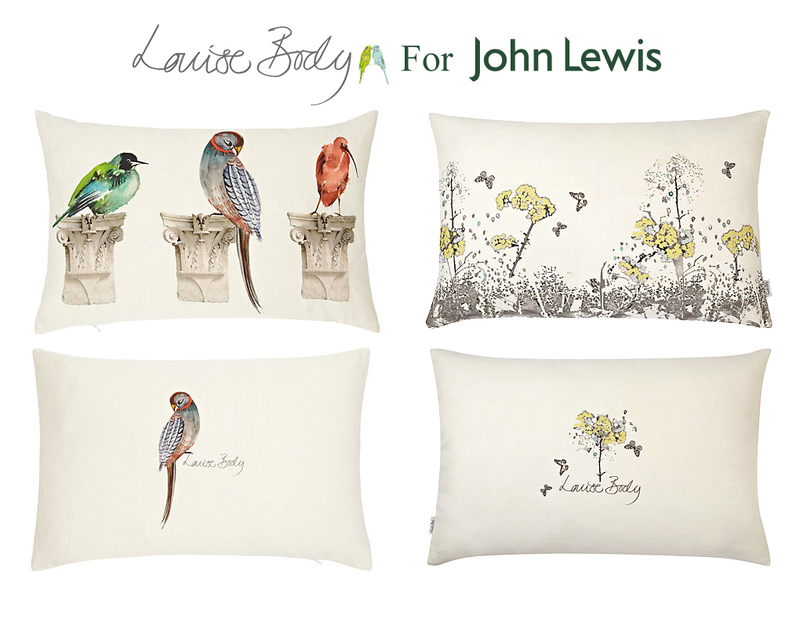 Louise has also designed an exclusive range of cushions for John Lewis. Click on the link to see the range. Limited edition Giclee prints of Louise's original watercolour paintings featured in her 'Perched' wallpaper are now available to buy. These beautiful prints onto 310g artists paper are numbered and signed by Louise. These playful, 'make your own' greetings card sets are perfect as stylish gifts or for making unique, designer cards to send. There are 3 sets: 'Birds', 'Plant Life' and 'Christmas' each presented in an attractive tin. They contain blank cards, envelopes and beautiful stickers of images and motifs from Louise's designs as well as words of greeting and congratulation. An old wall encrusted with lichen formed the starting point for this collection. The subtle colours and textures of the wall are beautifully illustrated giving an atmospheric quality and depth to the designs. 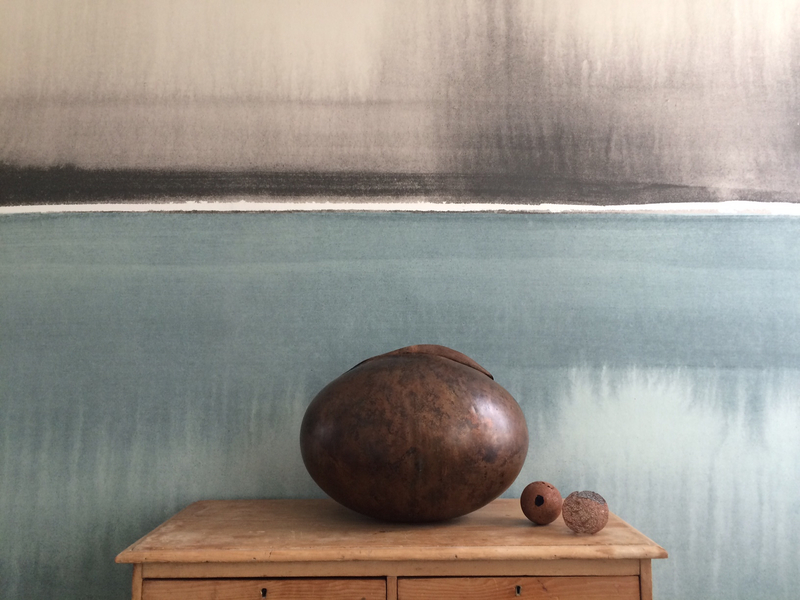 Louises drawings and photographs work with the texture of the stonewall to create 4 very different wallpapers. A coastal nod to Louises home town, Hastings. The seagulls started life as charcoal drawings and the texture of the old wall is reminiscent of sea spray, chalky cliffs and sandy beaches. Watercolour paintings of real and imaginary birds perch on plinths adorning the stonewall, evocative of botanical gardens and victorian aviaries. This design has a very painterly and textured feel. Delicate drawings and photographs of cowparsley, foliage and butterflies evoke feelings of hot summers, country walks and old buildings. Stonewall creates a beautiful backdrop with suggestions of times past but also has a very modern feel. Used on its own, this design works very well as a subtle background texture but can also be hung with Sea Birds and Perched. All of the above designs are available in 3 different colourways: Chalk, Flint and Sand. 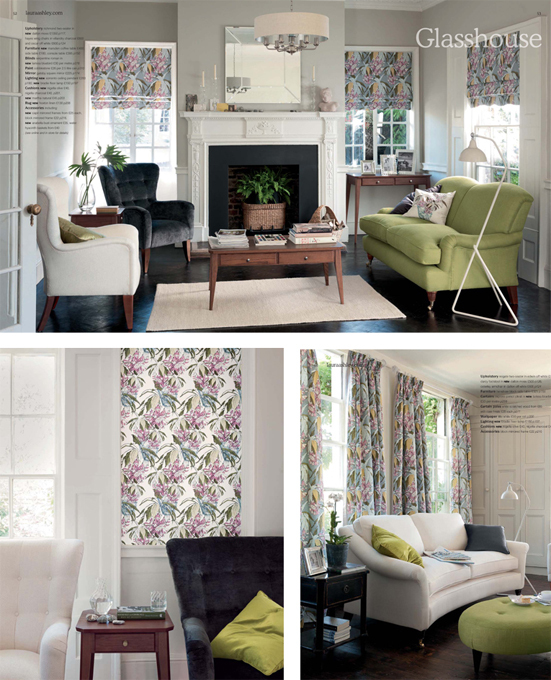 Louise was asked to design a collection in her signature style for Laura Ashley. 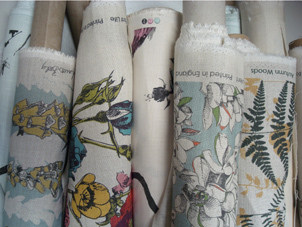 The result is a beautiful collection called Glasshouse including Larissa Bluebird Fabric and Martha Hollyhock wallpaper. It is available now as part of the SS12 Laura Ashley collection. 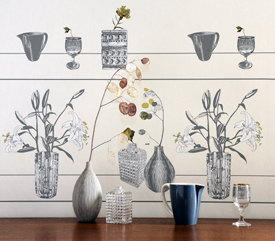 We have launched a new collection of wallpapers and fabrics called 'Still Life. The inspiration for this collection comes from loved objects passed on through generations. All of the pots and vases featured in the designs have been handed down through Louise or her partner's families and the watercolour paintings of a Carnation and a Petunia were painted by her Grandmother who was an artist. Louise's love of combining drawings and photographs is very apparent in these designs which give the collection a strong contemporary feel while retaining a sense of timeless design. 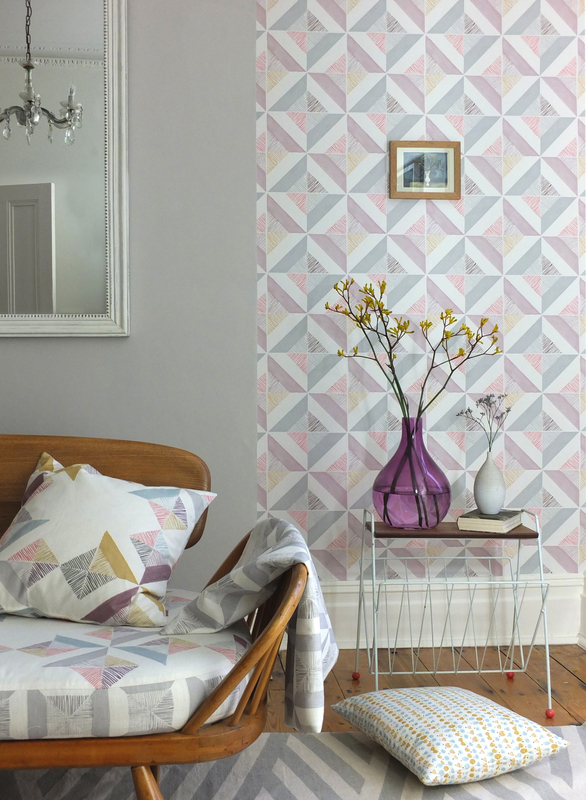 May 2011 sees the launch of Louise Body's striking new 'Paper Tiles' collection. These 7 decorative tile designs represent a temporary departure from Louise's signature motifs and the conclusion of a creative process started by her commission to design the restroom foyer area at Decorex 2010. 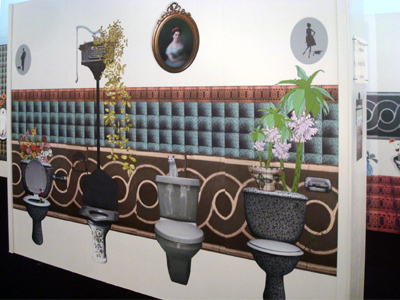 Her 'Decorex Loos' wallpaper panels featured decorative Victorian tiles and it was a subject that Louise was keen to explore further. 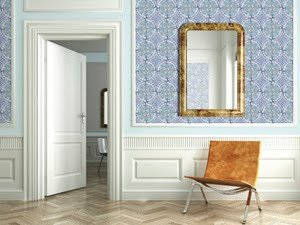 The delicate and beautiful new wallpapers have a sense of fun and at £20/m offer an economical alternative to decorative ceramic tiles. The designs incorporate original Victorian tiles enhanced by Louise's colour palette and the addition of her photographs and delicate drawings of flowers. They are printed onto hard wearing, coated, non-woven paper and would look just as good in an alcove or on a chimney breast as they would in a kitchen or bathroom. "Rejoice, rejoice for Louise Body, one of our most talented makers of papers and fabrics, has just launched a new wallpaper range. 'Paper Tiles' is, as its name suggests, a trompe l'oeil print featuring original Victorian wall tiles to which Body has added her own photographs and delicate drawings of flowers. What's more, the seven designs have all been printed onto paper so robust that we can really can use it in place of ceramic tiles. Buy now and get papering that kitchen"
Louise's wallpaper adorned the walls of the VIP and Press lounge at the Sleep Event, Business Design Centre London. 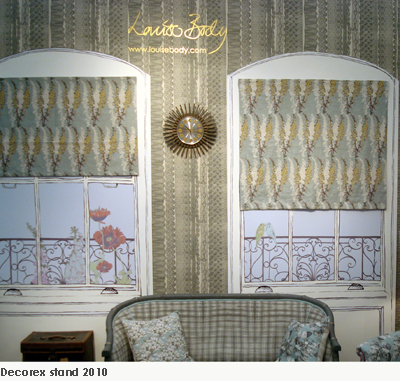 Louise had a very successful show at Decorex. Thank to everyone that came to visit us on our stand. See you next year! Louise will be launching her first and long awaited fabric collection at Decorex this September. Visit us on stand A6 to see our new collection. 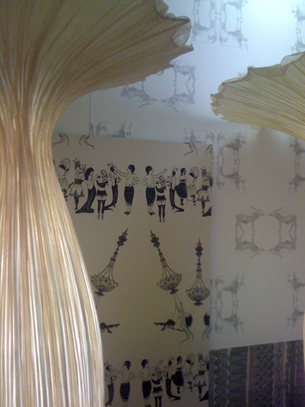 Louise has been asked to design a wallpaper specifically for the restroom foyer at Decorex. Rising to the challenge of an unusual project, Louise has designed some truely original and beautiful 'Loo Paper' which is sure to make you smile. 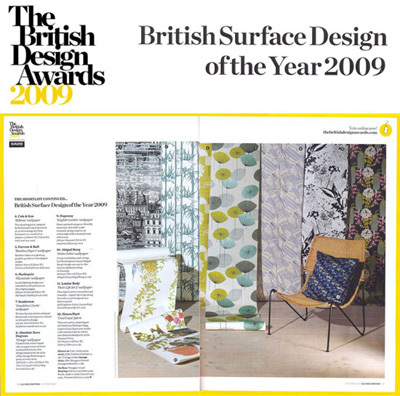 Louise has been nominated for the Elle Decoration British Design Awards for her 'Plant Life' wallpaper. Louise will be collaborating on a range of footwear for iconic brand Dr Martens. 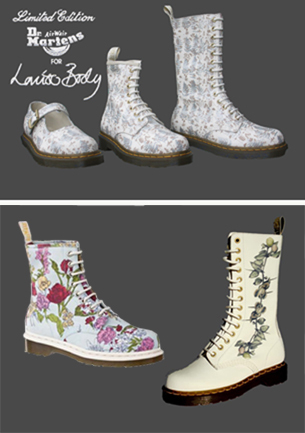 Louise will be producing 3 different designs for Dr Martens over 3 seasons starting in S/S 2009. The first season will see Louise's 'Birdie' design adorning the iconic 8 hole boot in soft white leather with gold button holes. A/W 2009 will see Louise's Autumn woods design with added sparkle on the 8 hole boot and Mary Jane shoe. S/S 2010 will see Louise's 'Plant Life' fabric on boots and the Mary Jane shoe. Louise will be collaborating with iconic British designer Paul Smith on a range of womenswear for the Japanese market. The 'Black Label' collection will feature some of Louise's signature bird designs on a range of dresses, shirts and T shirts and will be on sale in Paul Smith stores across Japan in summer 2008.